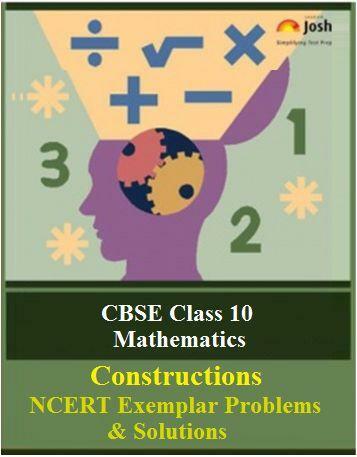 CBSE Class 10 Mathematics chapter 10, Constructions: NCERT Exemplar Problems and Solutions (Part-III) is available here. This exercise comprises the Short Answer Type Questions that makes Exercise:10.3 of NCERT Exemplar Problems for calss 10 Maths, Constructions. Every question has been provided with a detailed solution. Here you get the CBSE Class 10 Mathematics chapter 10, Constructions: NCERT Exemplar Problems and Solutions (Part-III). This part of the chapter includes solutions for Exercise 10.3 of NCERT Exemplar Problems for Class 10 Mathematics Chapter: Constructions. This exercise comprises of only the Short Answer Type Questions framed from various important topics in the chapter. Each question is provided with a detailed solution. Question. 1 Draw a line segment of length 7 cm. Find a point P on it which divides it in the ratio 3:5. 1. Draw a line segment AB = 7 cm. 2. Draw a ray AX, making an acute ∠BAX. 3. Divede AX, in 3 + 5 = 8 equal parts AA1, A1A2, A2A3, A3A4, A4A5, A5A6, A6A7 and A7A8. 5. From A3, draw A3C || A8B intersecting AB at C.
6. Thus C is the required point on AB which divides it in the ratio 3:5. Question. 2 Draw a right ΔABC in which BC = 12 cm, AB = 5 cm and ∠B = 90°. Construct a triangle similar to it and of scale factor 2/3. Is the new triangle also a right triangle? 1. Draw a line segment BC = 12 cm. 2. From B draw a line AB = 5 cm such that AB ⏊ BC. Thus given right DABC is obtained. 4. From B draw an acute ∠CBY such that A and Y are in opposite direction with respect to BC. 5. Divide BY into three equal parts, BB1 = B1B2 = B2B3. 7. From point B2 draw B2C’ || B3C intersecting BC at C’. 8. From point C’ draw C’A’ || CA intersecting BA at A’. DA’BC’ is the required triangle of scale factor 2/3.This is also a right angled triangle. 1. Draw a line segment BC = 6 cm. 2. Taking B and C as centres, draw two arcs of radii 4 cm and 5 cm respectively, which intersect each other at A. 3. Join BA and CA. ΔABC is the required triangle. 4. From B, draw an acute ∠CBY such that A and Y are in opposite direction with respect to BC. 6. Join C and from B5 draw B5C’ || B3C intersecting the extended line segment BC at C’. 7. Again from point C’ draw C’A’ || CA intersecting the extended line segment BA at A’. Thus, ΔA’BC’ is the required triangle similar to ΔABC and of scale factor 5/3. Question. 4 Construct a tangent to a circle of radius 4 cm from a point which is at a distance of 6 cm from its centre. 1. Draw a line-segment OP= 6 cm. 2. Draw a circle of radius 4 cm taking O as centre. 2. Draw a perpendicular bisector of OP intersecting OP at M.
4. Taking M as centre and MO as radius draw a circle to intersect circle C (O, 4) at two points, Q and R.
5. Join PQ and PR. Thus, PQ and PR are the required tangents.